Sometimes I read a children's book and start digging in a bit to do a review, and I find that my heart is soaring, and that I'm sitting here with a grin on my face. That is how I feel, writing this blog post, about Carole Lindstrom's Girls Dance, Boys Fiddle. Her mom and dad, her brother, kids at school... they all tell her she can't fiddle. Girls, they say, have to dance. Her mom is teaching her how, and, gives her the shawl Memere (her grandma) wore when she first did the Butterfly Dance. Her mom wore it, too. Now, it is Metisse's turn to wear it. But, Metisse struggles. She can't move her feet right. She's much happier when she's playing the fiddle with Pepere (her grandfather). Look at the cover. That's Pepere teaching her how to fiddle. She's learning how to play the Red River Jig. Obviously, he thinks it is just fine that she plays the fiddle. As you might guess, it will turn out ok in the end. Metis fiddle music is a blend of Scottish, French and Aboriginal influences that began in the early fur trade days in Canada. The advent of the fur trade in west central North America during the 18th century was accompanied by a growing number of mixed offspring of Indian women and European fur traders. As this population established distinct communities separate from those of Indians and Europeans and married among themselves, a new Aboriginal people emerged - the Métis people - with their own unique culture, traditions, language (Michif), way of life, collective consciousness and nationhood. Did you happen to see the woman with the fiddle? Go ahead--watch the video again. She's toward the end. When, in the story, Metisse starts to fiddle at the gathering, her grandparents jump up and start dancing. That page stole my heart! It made me think of the many times I saw my grandparents or parents jump up to dance together. I found lots of videos of Metis people jigging, but click over and watch Elder's Jigging Contest 2011 New Yr's. It looks like such fun! Thanks, Carole, for this delightful story. 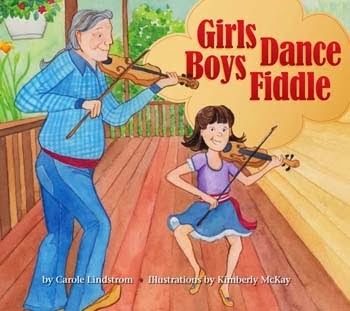 American Indians in Children's Literature highly recommends Girls Dance, Boys Fiddle, written by Carole Lindstrom, illustrated by Kimberly McKay, published in 2013 by Pemmican Publications, Inc. Yesterday (October 13, 2014), The Guardian ran an article titled Diverse voices: the 50 best culturally diverse children's books. I don't know all the books on the list, but I do know two that shouldn't be on any list of culturally diverse books. Culturally diverse books must not have stereotypes! That illustration, unfortunately, perfectly reflects several stereotypical ideas about Native peoples. She's barefoot. You know that Native people wore shoes, right? She's wearing what we might generously call a Plains headdress--the item that shouts INDIAN to the world. She's not smiling, because, as everyone knows, Indians don't smile. 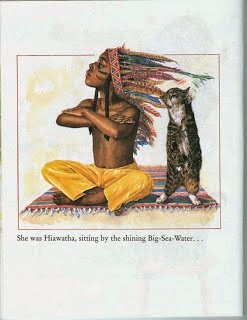 Hiawatha. There was an actual person named that, but the one she's portraying is a character created by a non-Native person. I don't know who put the list together for The Guardian. The problems with these two books are blatant. Or, they should be! That they're not is an indicator of how much we have yet to do with regard to Native imagery. I'll tweet my post to them and others who are tweeting/retweeting it. Please share it with others in your networks. As I write this post, Stephen Krensky's Christopher Columbus is ranked at #1 in e-book biographies for children. The paperback edition is ranked at #3 in historical biographies for children. I'll start by saying that I don't recommend Krensky's book. There are people on the island. He names the island San Salvador. He says it now belongs to Spain. to the people who live there. See? Krensky essentially says "wait up Christopher, you're wrong about that!" Sounds good, doesn't it? Don't be taken in! It might seem like Krensky is giving us something different from the "Columbus discovered America" myth, but... let's keep reading. Most are helpful and friendly. Most? Who isn't helpful or friendly to Columbus? And why were they not helpful or friendly? Krensky doesn't say. six Indians to come with him. Krensky tells us that Columbus is taking Indians to Spain so people can see them? Why didn't Krensky rebut those last two lines, like he did earlier when he said that the island really belonged to the people who lived there? a world that no one in Europe knew about. "Discovery"? "[F]ound a new world"??? I can hear defenders say "but Krensky says it was new to people in Europe! Leave poor Krensky (and Columbus) alone, you mean woman! You leftist liberal!" Does Krensky want kids to feel sorry for Columbus because he didn't (according to Krensky) know how great his "discovery" was?! On one page, in one place, Krensky pushed back on the Columbus myth, but everywhere else? He just told the same-old-story! Krensky's book, as noted earlier, is in the "Step Into Reading" series. Books like it are ones designed to help kids become independent readers. Christopher Columbus is a "Step 3" book. That means it is for kids in grades 1-3. Becoming an independent reader is a powerful moment in a person's life. Books that help with that process can take on a lot of emotional weight. They did for me, and likely for you, too. Go to the library. Get one that you read. See what sorts of strings it tugs as you turn its pages. The frightening thing is that a reader can also develop emotional attachment to the content of books like this. Even more frightening is the information I shared at the very top of this post. This is a best selling book. It was first published in 1991 (no doubt to coincide with the 500 year "anniversary" of Columbus "discovery" of the "New World") and it still going strong. Do you know of a book for independent readers, or a picture book, that honestly presents information about Christopher Columbus? Betsy Bird at SLJ says she's just learned of one that might do a better job of telling readers about Columbus. Due out in January of 2015, we'll have to wait and see. In the meantime, those of you with older or capable readers can get Thomas King's brilliant Coyote Columbus Story. I recommended it in 2006. If your child comes home today with coloring sheets of Columbus and you want to push back on what he/she was taught, the Zinn Education Project has an excellent page of resources. In early October, over on Twitter, Jillian asked me if I'd seen As An Oak Tree Grows, by G. Brian Karas. She noted the wigwam in it, and that a "big stopping point" for her and her students was the page where the text says that the little boy "grew up and moved away." As An Oak Tree Grows was published in September of this year (2014) by Nancy Paulsen Books (an imprint of Penguin Young Readers). Below are photos (apologies for them being kind of blurry) of the first three double-paged spreads of As An Oak Tree Grows. First, we see "a young boy" planting an acorn on a late summer day. See him in the middle of the double-paged spread? 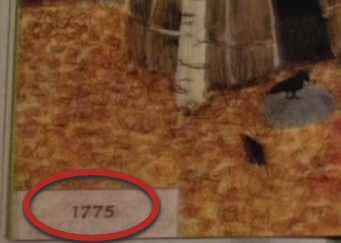 At the bottom left corner of the next page (see enlarged photo to the right), we see a year (1775) and on that page, we read "later that year" the tree sprouts. So, the time when the boy plants the acorn is meant to be summer, 1775. Go back to the page (above) with the little boy in the center. Notice there's nobody there except for the boy and someone on the water, in a canoe. They're obviously meant to be Native. Karas includes a wigwam, so he must know a little about the people he is showing us on this page. But! Karas doesn't say anything about the boy's tribal nation. That omission matters to a Native reader, and it ought to matter to every reader. Without that information, readers are kept ignorant of who Native peoples were/are in terms of our distinct identities as nations. And, the omission obscures the fact that European and Native leaders engaged in diplomatic negotiations (treaties!) about the land and its use. One question you could ask about the boy (as Jillian did), is where are the rest of his people? This "empty land" image is a big part of the justification for colonization. Unused land! There for the taking! Wrong. On the second page we see the boy taking his dad to see the little tree (question for botanists: I think the time sequence for the acorn sprouting is off a bit). See what has changed on the shoreline? Karas shows us that someone (Europeans) have established themselves and, as the two ships in the water show, more are coming. The page suggests a rather idyllic life with two cultures co-existing, but it was far from that! Tribal nations along the northeastern coast had, by 1775, been fighting to protect their homelands for over 100 years. The third double-paged spread (below) is the one that tells us "The boy grew up and moved away. Farmers now lived here." That page was the "stopping point" for Jillian and her class. She and her students know, I think, that it was more than simply a boy growing up and moving away. An uncritical reader likely wouldn't notice the problems in those two sentences, but there are, in fact, many things to note. The boy and his nation were likely forced off the land that they had been farming. Yes--they were probably farmers, too, but the pervasive image of "primitive Indians" usually pushes that fact off to the side. When will we see an end to stories where Indians just go away? We didn't go away. Nancy PaulsenThis bk abt revealing changing landscape; maybe for another bk @debreese: ...any discussion re boy leaving land for white farms/prosperity? Nancy Paulsen& hopefully teachers will discuss terrible cost of "progress" @debreese ...my review of AS AN OAK TREE GROWS: [link to my review]. Thankfully, Jillian (the teacher who brought this book to my attention) has a critical eye. Several people on Goodreads do, too. That is encouraging! I wonder if Paulsen or Karas are reading those reviews? Might they do something different (if they reprint it later), in light of this reception to that part of the book? Allie Jane Bruce at Bank Street College Center for Children's Literature shared a discussion she had with students about the book. Take a look: Rewriting History: American Indians, Europeans, and an Oak Tree.